Some days she seems to spend more time logging than lifting. “Sometimes your only reason for hitting the gym is to test-drive your new device!” I told her recently, and she reluctantly agreed. Everyone likes a convert, right? For my birthday she gave me a fitness tracker and I instantly became sold. While I admit tracking allows me to up my game, I’m not compulsive about monitoring every little detail. Yet in the wrong hands I can see why these gadgets could become trouble. In the era of legwarmers and Jane Fonda workout videos, fitness buffs used pedometers and heart-rate monitors. Do you really need these cool, sleek gadgets to measure, track, and record every rep, spoonful, and hour slumbering? Not really. Old-school folks, whom you’ll occasionally still see at the gym, monitor their progress with pen and paper. My advice: figure out what works for you and do it. After all, what you measure, you can manage and improve. Sometimes seriously improve: a study in the American Journal of Preventive Medicine showed people who wrote down everything they ate lost twice as much weight as those who didn’t. No kidding. Whatever your goals, tracking can increase accountability, indicate you’re moving in the right direction (literally and figuratively! ), and take your routine to a new level of excellence. Just don’t spend more time tracking than actually doing the work. Let’s be real: if you’re the type who obsessively measures every detail, these gadgets could become more problematic than helpful. I’ve seen this happen to my friend and others. While at first the novelty becomes endearing, over time people come overwhelmed and burned out. Your ultimate goal is tracking, not hyper-analyzing every detail. Know thyself! You’re pretty sure a tracking device won’t overrule your life and you’re ready to give one a try. Among the keys for finding the right tracker include reliability, affordability, simplicity, and a science-based, reputable manufacturer. Coupled with my friend’s input, I spent hours researching these devices. A smartly engineered, easy-to-use tracker is like having a best friend or fitness coach and nutritionist monitor your every move without invading your privacy. Want to substantiate the hype? Do your homework and plan to spend at least $100. (You could spend more, but the sweet spot for these gadgets seems to be about $100.) Based on my research, I would rank these among my top choices. Note: I am not affiliated with any of these manufacturers and simply recommend these because they’re top-rated, affordable, and address the needs of my audience. 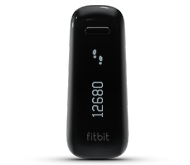 · The Fitbit One – calling the Fitbit One a pedometer is like calling a Ferrari a car. Sure, it measures how many steps you take, but also calories burned and sleep accrued. It can even wake you without waking your partner! On Fitbit.com you can track more info like what you ate and how much you lifted. PC Magazine ranked this one number one, and for under $100 I have to agree. · Fitbit Flex – when you want to track everything on your wrist. Simple, stylish, and smart, the Fitbit Flex synchs beautifully with your mobile device and features sleep tracking, silent wake alarm, and other cool features of the Fitbit One, for around $100. My take: wearing it around your wrist makes you less prone to lose this one! · UP by Jawbone – another wrist tracker similar to Fitbit Flex, but with a slightly different design and color options. You can track everything from movement to sleep quality (it can wake you without disrupting your sleep cycles) to eating habits. Like a good coach, it can even offer suggestions to improve. · Omron HJ-112 – your basic pedometer is steps above (pun intended!) those ancient 1980s models. This one has a seven-day memory with six tracking modes that include time, distance, calories, and fat burned. It measures both regular and brisk steps separately. When you need just the basics, you can’t go wrong with this affordable pedometer (under $25 at amazon.com) to track your progress. Not ready to take the leap into triple-digit fitness gadgets or fear they might overpower your workout? These are among my favorite apps to get your feet wet without taking the full-gadget plunge. Best of all, they’re all free. · Lose It – this tracker helps you merge your workout and food journals. A list of generic and name brand foods provides calories, carbs, fiber, and protein. Based on your workout, it tells you how many calories you’ve burned and perhaps best of all, how many you can still “legally” eat for that day. - while this app won’t replace your trainer, it does provide 280 exercises and 52 workout routines from beginners to advanced users. · IntervalTimer - Seconds by Runloop – thousands of five-star reviewers can’t be wrong. Whether you’re doing circuit training, Tabata, or simply bursting up a hill, this cool app saves your timers, helps you organize them into groups, and track your current/ max/ average heart rates. You probably have your own favorite fitness gadgets. I want to hear from you: what do you use and why? Do you believe the ones I mentioned above are truly best in class or do you have other suggestions? I would love to hear from you in the comments section below or on my Facebook fan page.